From the 2423m height of the Hochjoch Hospitz we were to climb to the 3272m of the Brandenburger Hütte. 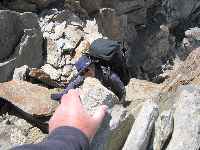 The initial path is a fairly normal one, then traverses some steep scree to arrive below the glacier. 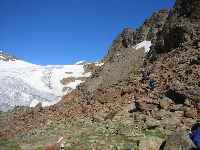 An ascent of the valley scree allows one to access the glacier above the snout; going directly on to a large low-angled section. 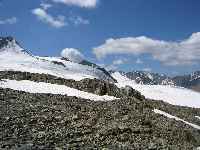 In my two previous visits the route had been up the right of the glacier. This time a well-marked way led up the centre of the glacier. The route was easy with only closed crevasses present. Best of all, a high-pressure weather zone had moved in and the weather was sunny and the skies were blue. This was all I had hoped for. 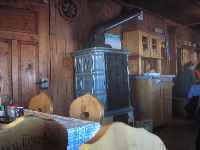 The Brandenburger has always been my favourite alpine hut and these were the perfect conditions to visit it. We stopped below the hut and persuaded someone to take our photo. 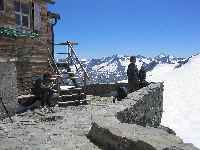 Then we unroped and made our way up the steep snowy slope to the hut. It was good to sit on the tiny terrace again. And this time there was even an extra: an eagle was slope-soaring nearby with a gang of choughs harrying it. 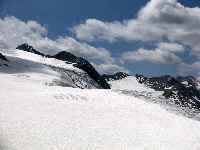 The other three spent the afternoon crossing the glaciers towards a ridge, but were frustrated in ascending it by a band of ice that needed crampons. I sat on the terrace, just enjoying being there. Later, at dinner time, I was looking at the chairs. These had just been delivered by helicopter during my last visit in 1984 and my son and I had helped carry them in from the old helicopter pad. It is just a little sobering to realise that the present Hüttenwart is two years younger than my son. Click here to see the chairs arriving in 1984. It is good to be able to report that he is an exceptionally helpful and friendly hut warden. He must have his work cut out, since he is also the warden of the Hochjoch Hospitz and these are both huts with "helicopter-only" provisioning. The weather was now to be set fine for some time. We enjoyed the walk down to the Hochjoch Hospitz and the bowl of soup for lunch there even more. After lunch we were away off to Italy. 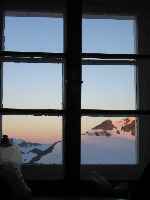 Our target for the night was the Schöne Aussicht (aka Bella Vista) hut. This is a DAV hut operating inside Italy. Our journey proved interesting. The start was vigorous, but on a fairly conventional path. 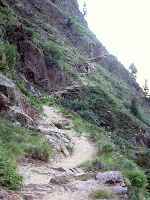 It was on the second stage that the path took to traversing a steeper-than-usual scree slope seemingly held up by a rising strata of layered rock. 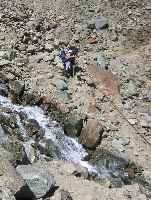 As well as being steep, the path could sometimes be extremely narrow. It also had another interesting feature. At one point there was a stream crossing the path and it was spanned by a rope bridge with a little seat like a ski Poma tow on which you were supposed to drag yourself across. We investigated it and decided that it was lethal to anyone wearing a heavy rucksack; you would have turned upside down. Alun had, I am sure, the correct idea in saying that the only way to do it would have been to take off your rucksack and tie it to your ankles. I have now added this one to my collection of interesting bridges. On our way we met an American couple coming from the hut, who were singing its praises. Subsequently we were to agree that it is a pleasant hut. Perhaps we would contest the name of the hut; it is situated in a mass of ski fields and lifts and the view was not really beautiful. However, the rooms were certainly comfortable and the showers were good and they were free! An interesting feature was a notice inviting you to save water by sharing your shower with a friend. Unfortunately I could not convince either Katharine or Rosemarie that it was a good idea and I drew the line at sharing with Alun. The other feature was a sort of "massed start" dinner with everyone receiving the courses at the same time: just like college. After dinner we talked to a pair who had just come over from the Similaun Hütte and who pointed-out their route to us. We set off by dropping down to the ski slopes and then climbing steadily up the snow, mostly on ski runs. We then traversed on snow to the scree slope that had been pointed out to us last night. There was a climb up some steeper snow to reach it, then up a slope. This qualified as a Hillside from Hell. It was much steeper than a scree slope. It was made of big jagged rocks embedded in fine silt. There were no solid rocks protruding through it anywhere and every bit of it was capable of movement. It even had a few bits of ice incorporated in it. It was quite big too. I think we were all glad to get to the top of it and pleasantly surprised to find we were all still alive. We were full of admiration for the pair who had descended it! Once off the loose slope we were on steepish rock which, by and large, was attached to the rest of the mountain. This now proved something of a relaxation exercise. That got us into a steep hanging valley full of snowfields. 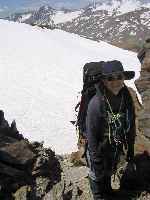 An initial inspection showed that someone had marked a route up the left which ascended some very steep rock, rather than using the snowfields. Our first attempt at the rock failed. While we were taking stock of the situation, I thought that I would go across to look at the snowfields. These proved possible, although they were bigger and a little steeper than they looked. Also, the most promising-looking one had a nasty run-out below and so I had to use another. I cut good big steps on the assumption that the other three would be following shortly. As I reached the top I looked back and the others had vanished. I was later told that they had put on chest loops or harnesses and had used them Via Ferrata fashion on some fixed wires they had found on the marked rock route. Thus secured they had launched a more determined attack on the rock and gone up it. I spotted them near the top of their climb and I then had to go down across snow slopes to rejoin them. Together we crossed the glacier which ran past the top of the ascents and climbed a ridge which separated it from yet another glacier. The rock on the second ridge was easier and proved to be fun. That is where the adjacent photos were taken. 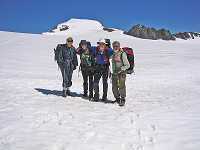 The onward route skirted the top end of the glacier on a well-trodden route through good snow. Now we had a mixed patch of ground to traverse and we could see a strange large cairn topped with a shiny ornament. 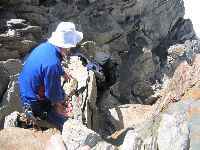 This is where the body of "Ötzi the Iceman" had been found. Although he had been buried in snow for some hundreds of years, the cairn now stands on bare rock that was almost totally free of snow at the time of our visit. From there the route crossed more rock and skirted a ridge on more good-quality snow. 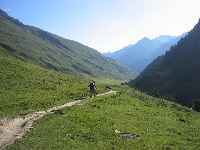 It then ran along the top of a rocky ridge before coming steeply down to the Similaun Hütte. The blue-rinse crowd are certainly not be going to be making the trip to the Ötzi Monument in force! We continued on down to the Similaun, which was very full with the weekend crowd. We were given space in a little separate building with a small bell tower. The hut was packed out at dinner time and there was a certain amount of recycling of table space. 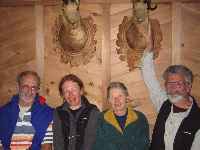 The two chamois on the wall behind us were keeping well out of it, although they seem to have twisted their horns at some time in the past. A short journey today: just down to the Martin Busch Hütte. 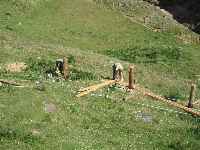 We knew it would not be too onerous because a lady arrived at the Similaun last night having pushed her mountain bike up a snowfield. It was our arrival there that created the problem. 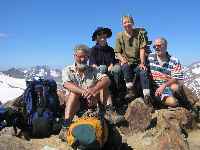 One of us had not renewed their alpine club subscription this year. Since the hut was fully booked and it was early in the day, we were told that three of us could be found places, but the fourth could not. Then followed a long set of discussions as to what our possibilities were for the remaining part of the holiday. The answer was that they looked very bleak. In the end we did the only thing possible: our fourth member joined the DAV on the spot at a rather high fee of €82. 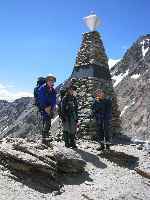 Once settled in to the hut, the others set off up to the Kreuz Spitze. I stayed in the area around the hut taking some photos and getting a good view of professional techniques for building fences on rocky hillsides. This would be our last whole day in the mountains and the weather was holding good. Instead of going across to the Ramolhaus, we decided to go back to the Hochjoch Hospitz via the Saykogel. This was quite a strenuous plod up a shattered ridge of irregular boulders, but a pleasant situation and a summit with super views. The rest of the way involved a drop of 1080m to the river. There were pleasant views and sunshine on the way, which was good for our final day. Over the last section the "girls" raced ahead and Alun and I plodded up the final hill to the Hochjoch Hospitz, sweating in the warm sunshine, to be met with glasses of beer that Katharine had waiting for us. Delicious! Our descent had also given us a chance to look at most of the previous day's route from a different angle. Though our horrible hillside was hidden, tucked just behind a dark and sinister rocky buttress. Nearly all over now. Today we actually got up earlier today than we had on any of the "climbing" days. 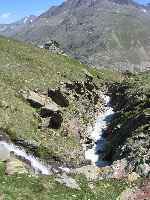 We had a fairly long walk down to Vent since the path up to the Hochjoch Hospitz lies along a fairly rugged valley. 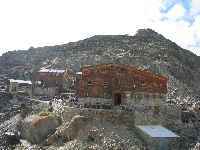 The hut lacks a seilbahn for supplies because of the twisting approach canyon. It is spectacular and the hut path through it is of high quality and covers some attractive ground. As we approached Vent it all seemed very green and fertile after a week at higher levels. There were still some interesting bus connections and rail journeys, not to mention a few hours in Salzburg, but our enjoyable holiday was at its end.